The Sony Xperia XA is the low-cost entry in Sony's new lineup. Apart from the cameras and the battery life, it offers a mediocre serving. Find out why it might still be of interest in our full review of the Sony Xperia XA. The Sony Xperia XA is currently available for pre-order with a shipping date of July 17. The price is set at $279.99, although Amazon is currently offering it at a reduced price of $267.97. It's available in white, graphite black, lime gold and rose gold. Alternatives for this price are the 5.5-inch Moto G4 Plus, which houses more power, or the Honor 7, which has better battery life. The Sony Xperia XA looks and feels very good, despite lacking the metal unibody of the Xperia X – it instead has a plastic enclosure. Unfortunately, Sony has omitted the splash protection that the Xperia XA’s predecessors, the Xperia M4 Aqua and Xperia M5, featured. The Sony Xperia XA is beguiling to the touch. It feels pleasantly matt and smooth and has an edgeless and gapless design. The volume rocker sits slightly higher than on many other Xperia models, making it easier to reach. A discrete flap on the side of the phone can be removed with your fingernail, granting you access to the Nano-SIM or microSD card slot without the need for a special tool. However, the flap is not sealed against liquids and dust. The Sony Xperia XA weighs 137 grams and is 7.9-millimeters thick. The most visible design differences to the Xperia X and X Performance models is the XA’s lack of fingerprint scanner and, as mentioned previously, its choice of casing material. It’s impossible to say how well the plastic casing copes in the long term, as we only tested the device for a week. Sony does offer a selection of protective cases for the Xperia XA. Firstly, there is the flip cover, which comes in the four possible body colors. When you flip the cover open, the display is automatically activated; close it and the display switches off. Next up is the StyleCover SBC26, which is also available in the four housing colors. It is placed over the rear panel and device edges, protruding slightly above the edge of the display. Then there is the Smart Style Cover SBC24, which is thin, transparent and practically invisible. The metal edges on the left and right side of the Xperia XA are cool to the touch. The display of Xperia XA is faint and humble. Even at maximum brightness, it is not easy to read on bright days. And small fonts show a visible seam about the edges of the characters. The display of the Sony Xperia XA is 5 inches and features HD resolution (1,280 x 720) making for 293 pixels per inch. Other reviews confirm that the display has a brightness of 502 cd / m² and a contrast ratio of 1564:1. Sony uses its in-house Triluminous technology on an IPS display. In the display settings you will find two color profile presets from Sony: the Mobile BRAVIA Engine 2 and the Super Vivid mode increase the saturation of images and videos that you look at in Sony's Gallery app. Outside of the app, the profiles have no discernable effect. The software of the Sony Xperia XA comes with a lot of preinstalled apps. Since you’re unlikely to use many of them, none of them can be uninstalled, and they occupy a lot of space on the scarce internal memory, they are a very annoying inconvenience. Sony gives the XA Android 6.0 Marshmallow. We tested the device in July, but it was still only covered by the April security patch. Thus, Sony is less reliable than Google, Samsung or HTC when it comes to security. Those three manufacturers provide software updates earlier and address known vulnerabilities in a more timely manner. Besides Sony’s own apps, there are also a range of third-party apps that come preinstalled. Our review device came with Amazon, AVG Protection, Facebook, Kobo eBooks, Sky Go, Spotify and SwiftKey. Thus, the internal memory left at your disposal is less than 5 of the original 16 GB. Aside from the camera, everything is a little slow paced on the Xperia XA. Games have mediocre graphics, apps start with noticeable load times and multitasking is no fun. If you only change between the camera app, Facebook and WhatsApp, the XA performs decently enough; everything else is a chore. Inside the Xperia XA, there’s the MediaTek Helio P10 processor, which has eight cores clocked at 2 GHz. However, the ARM Cortex-A53 CPU cores belong squarely to the mid-range. The chip’s GPU is the Mali-T860, which only has two 700 MHz cores, providing weak performance. The mobile internet, at least, is fast enough: the LTE is Cat. 6, offering speeds up to 150 Mbit/s. If you need more power, perhaps to play games, we recommend the Honor 5X over the Xperia XA. This is considerably better equipped and even costs a little less. Since Sony has laden the device with bloatware, the purchase of a MicroSD card is all but essential. If you want to use it to expand the internal memory, you will need a little know-how, however. 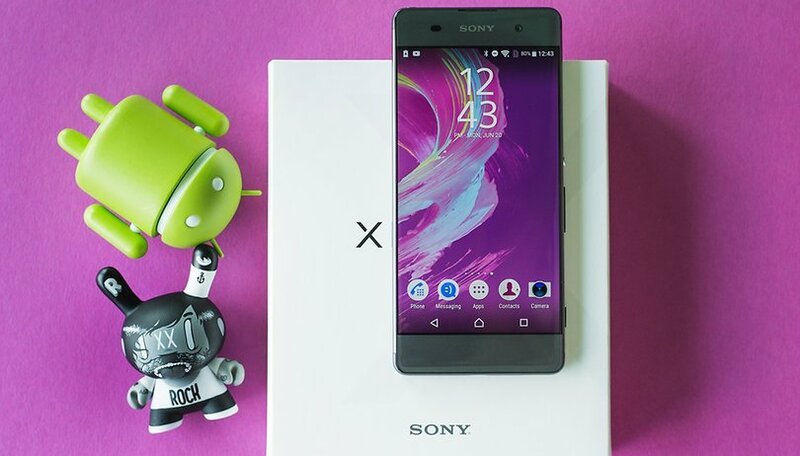 The Xperia XA runs Android 6.0 Marshmallow, which allows users to format MircoSD cards as internal memory, but Sony has decided to disable this option, so you will need a command line to get it back, making the process just a little more laborious. The internal speaker on the Xperia XA is weak and tinny. The voice quality when making calls is clear, however. The headset sounds warm and is well-shielded against background noise. The audio options allow for improvements to be made to the sound quality. Sony offers a five-band equalizer with bass boost for further adjustments. The Xperia XA’s cameras are the phone’s main selling point. The main camera delivers detailed, high-contrast pictures with bright colors. Only when looking closely can small artifacts be seen around the edges of objects. Even in low light it provides decent results. The Selfie camera is also above average. Sony has paid special attention to the camera equipment on the Xperia XA. The rear camera is 13 MP with an f / 2.0 aperture and a simple LED flash. The front-facing camera is 8 MP and also has an f / 2.0 aperture, plus an 88-degree wide-angle lens. The selfie camera has no flash, but it does have an HDR mode, which yields good results in backlit conditions. The hybrid autofocus on the Xperia XA with its phase and contrast measurement ensures practically instantaneous, blur-free shots. This, together with the dedicated camera button, makes the Xperia XA a solid replacement for a digital camera. The camera app features a manual mode, although it is not nearly as extensive as some, for example, on the HTC One A9 or Huawei P9. It is therefore advisable to shoot all your photos using the Superior Auto setting. The focusing is fast and provides mostly sharp results. The battery life of the Xperia XA is mediocre in comparison to its competitors. Particularly when using the camera app, the battery drains quite quickly. This is a shame: after all, the camera is supposed to be the Xperia XA’s main selling point. The PC Mark Battery Benchmark returns an operating time of 6:46 hours. When idle, the XA can last up to two days, but in everyday life you will need to charge it daily. The 2,300-mAh battery cannot be replaced, but you can fully charge it with the supplied charger within half an hour. Sony has boiled the Xperia XA down to two key features of the lower upper class: camera and design. However, looking to the left and right in this price range reveals some better alternatives. These might not take better pictures or look so chic, but they either last longer, work considerably faster or have better software. If you are a fan of Sony, there are even better products from the brand in the same price range. The significantly faster and also waterproof Xperia Z3 Compact is available now for as little as $240. Why Sony don't understand that smartphone top 1inch and bottom 1inch bezels look utterly useless and bad. And reduce screen to body ratio and increase phone size uselessly. Due to this reason I don't like sony phones. The z3 compact is a far better phone than the xa and cheaper. m using it for last few days....everything is good at this price except processor and battery capacity.